With the end of term finally here, Week 5 blues might seem like a distant memory. A bit like dog years, a Cambridge week feels like a fortnight in human time, with all the essays, the supervision work, the talks, the panels, the committee meetings, and all the social stuff that we manage to squeeze into 168 hours. Week 8 brings its own challenges and its own less pinpointable vibe. (I’m working on something more original than ‘Week 8 blues’.) That mid-term low didn’t hit me this term, and I think it’s because Week 5 feels, to me, like a tipping point after which the ‘time flies when you’re having fun-slash-handing-in-essays’ cliché really comes into play. Homesickness can be a weird emotion here, because there’s a paradox of ‘home’ in Cambridge: there’s a yearning to be back where you came from, to hear people rhyming ‘strut’ with ‘foot’ if that place happens to be north of Birmingham, to see the people you love and who know you inside out. But there’s an equal pull to stay at home. That is, the home that you’ve established here, with a new group of people who might not have seen you in nappies or primary school, but who’ve seen you – helped you, even – forge your Cantabrigian and, to a large extent, your adult identity. In a tug of war between the place where you started out and the one where you started out on your own, it becomes difficult to locate precisely where you ‘live’, and define what going ‘back home’ properly means. Part of the weirdness comes from the fact that Cambridge life is split right down the middle: 8 weeks here and 6 weeks there. It’s not so much that you can’t settle in either place, just that moving into and out of the Cambridge bubble takes a bit of adjustment. And sometimes when you’re in one zone and one mindset, the thought of other, if not exactly scary, can be a little dizzying. At this point in term, I hear a lot of people saying they’re ready to get back home, and whilst I really can’t wait to see my family and my best friends, I just don’t feel quite the same longing for home. Most of it is the pull of Cambridge: being busy, living next door to friends rather than a bus ride away, having total control over your own decisions and lifestyle plan, the ease of getting anywhere you need to be within 20 minutes. But these things are balanced by pulls of home – as I’ve written about before, sorting out everything for yourself can get a little brain-frazzling, and sometimes the balance can tip and the buzz of business becomes a little too hectic. The other factor, though, is one of those ‘twin things’. Of the stock questions which we have to grin through when people find out about our doppelgänger, my answers to whether we’re competitive, whether we argue, whether we dress the same, have remained pretty standard. (I’ve stopped responding to ‘you look so similar’ and ‘omg are you the same person’, just for the record.) 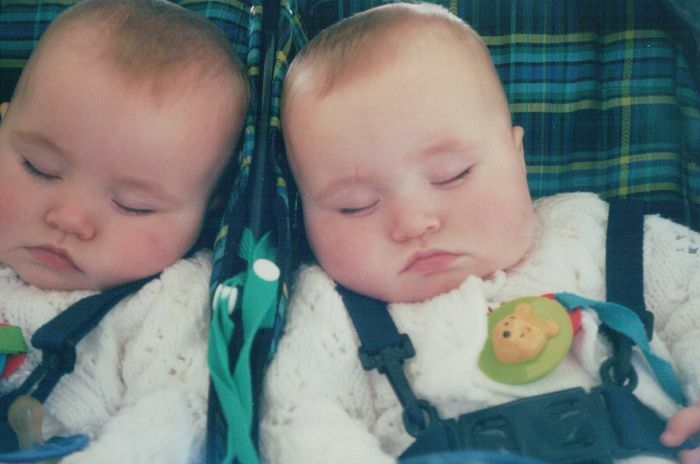 One that I struggle with more nowadays is ‘is it amazing being a twin?’ Briefly, of course, yes. Having someone who just gets it when you ring them up and explain in 40 seconds without breathing what you’ve been worrying or really excited or feeling weird about is a privilege. But that best-friend-who’s-always-around dynamic obviously undergoes a bit of a shift when you’re split between two cities. And the reason I no longer give an untempered YES to that question is because breaking away from always being around each other isn’t as bad as it ‘should’ be. Despite what my biology teacher told me in Year 9 about how awesome identical twins are, I’m probably not that special on this count. Flying the nest is just more freeing when you’re also going solo from an intensely close sibling relationship. Heading home last term, I felt, palpably and properly for the first time, like a grown-up in my house. That’s the part of my Cambridge self which survived the break. I came back to Cambridge this term, though, with my sense of twinness reinforced, and the necessity of regaining independence and mental space which that brings with it was urgent again. I love my sister, but she’d agree that Freddie Mercury sums up the feeling which has built up by the end of the vacation in ‘I Want to Break Free’. Remarkably easy to retain independence from my parents, it was more difficult to keep the personal, mental, emotional, and physical space – which even hectic Cambridge life allows – out of the twin zone. The end of term isn’t, of course, a farewell to independence, but it is the prelude to the adjustment period which kicks off a good break. Since time will fly, and since there’s not much time to do anything else even when lectures and supos are drawing to an end, it’s better to enjoy the last of Cambridge without worrying about negotiating the shift. Oxford must be so much easier to leave, being all-round less awesome – and thinking about that reminds me that I’d definitely rather be a bit between places than not here at all.